Alfred Wolmark was born in Warsaw, and moved to England with his family in 1883, first to Devon and then to the East End of London. He trained at the Royal Academy (from 1895), where he added the English 'Alfred' to his name, exhibiting there (1901-36), as well as with the Allied Artists Association (1908-16) and the International Society (1911-25). He had his first solo exhibition at Bruton Galleries in London (1905). Wolmark's teenage years in London’s East End and two lengthy stays in his native Poland between 1903-6, had a huge visual and spiritual, impact on his early Rembrandtesque work. In July 1911, after an artistic epiphany on honeymoon in Concarneau, Brittany, Wolmark jettisoned his early methods in favour of the ‘New Art’ and embarked upon the pioneering 'colourist' path that he followed for the next two decades of his working life. 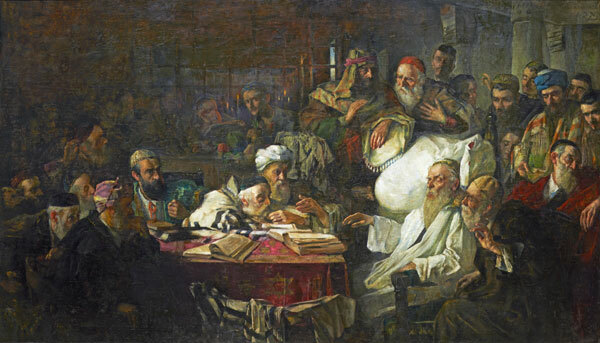 Wolmark exhibited regularly with the Ben Uri Art Society, as well as at the Grafton (1911, 1916, 1917) and Whitechapel Galleries (1910, 1914, 1927, 1956). In 1915 he co-founded the JAAS (Jewish Association of Arts and Sciences) with Adrian Alfred Woolfstein (Adrian Wolfe). Despite enjoying success within the Jewish community, Wolmark was rejected from The London Group (1914) and the Royal Academy (1938).